Possible to add BoE's from BoD? Thanks! I'm looking for an add-on offering a view per boss with people having bis/bip/offspec items needed. I had a look to Best in Slot Redux and had a nice surprise with some things on it but not exactly what I'm looking for. Are you interested doing this? Is it already in? Edit: I found what I m looking for in your add-on, really nice, but can I make a "save" in game? All is lost when people disconnect in the 2nd table. (*temporary) = "attempt to index global 'Uldir' (a nil value)"
I cant select a shield for my prot paladin for some reason? The 'select an item' icon Is greyed out. 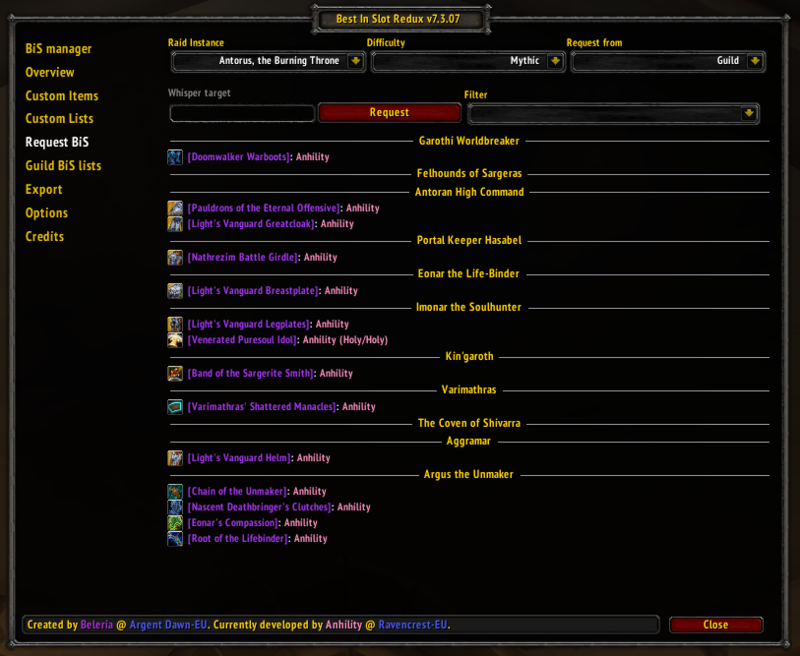 I really like the addon but I'd love to see an overview for all dungeons. 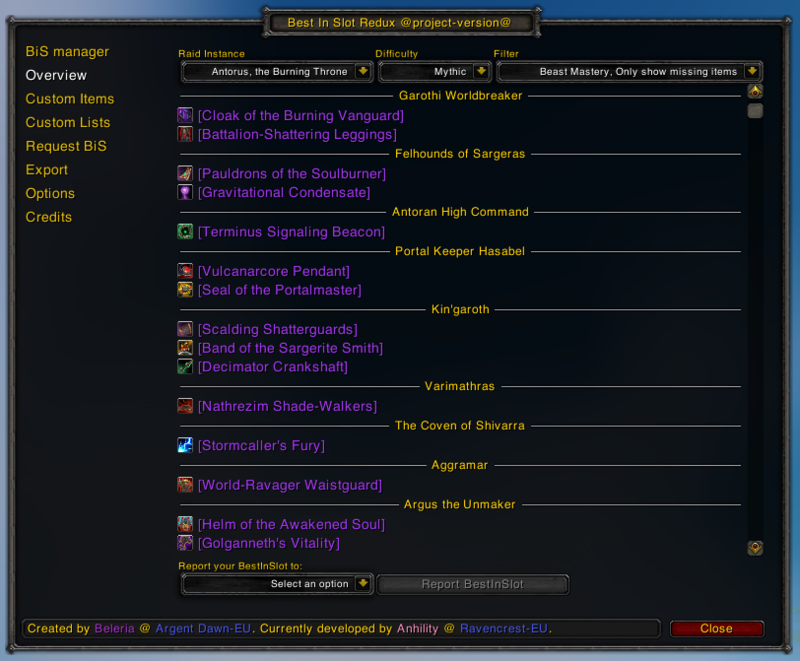 This should look similar to the Uldir overview with all loot from each dungeon as one entry. 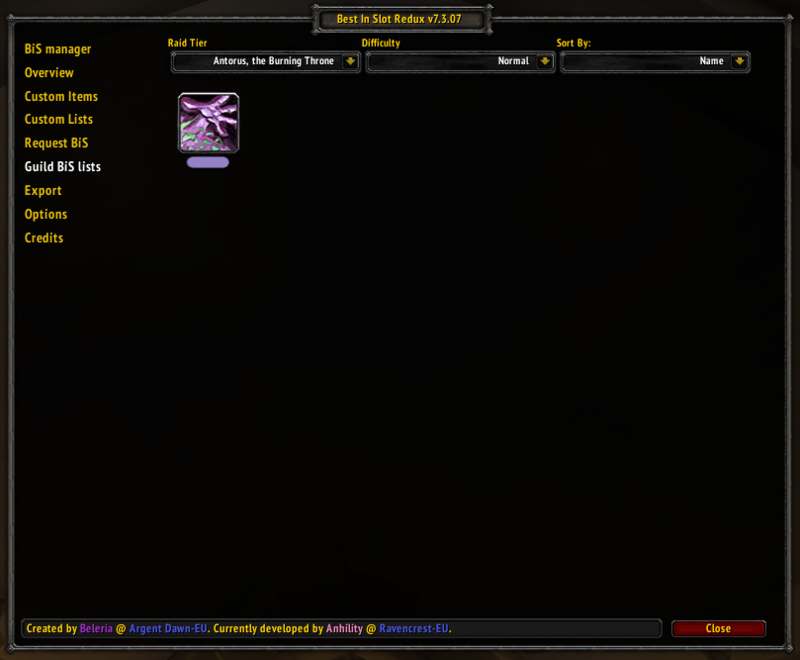 Checking the addon to see which mythic+ I should be running is somewhat tedious right now because I need to select each dungeon in the dropdown menu. There's some issue with the Overview Page. 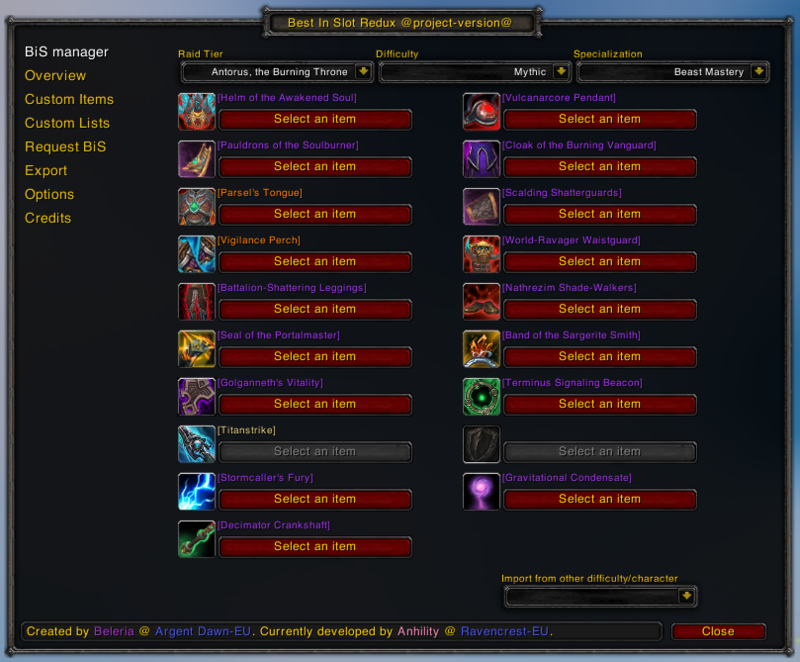 I selected my BiS Items and when I look at the Overview Page without the option "only show missing Items" there's not a single entry. 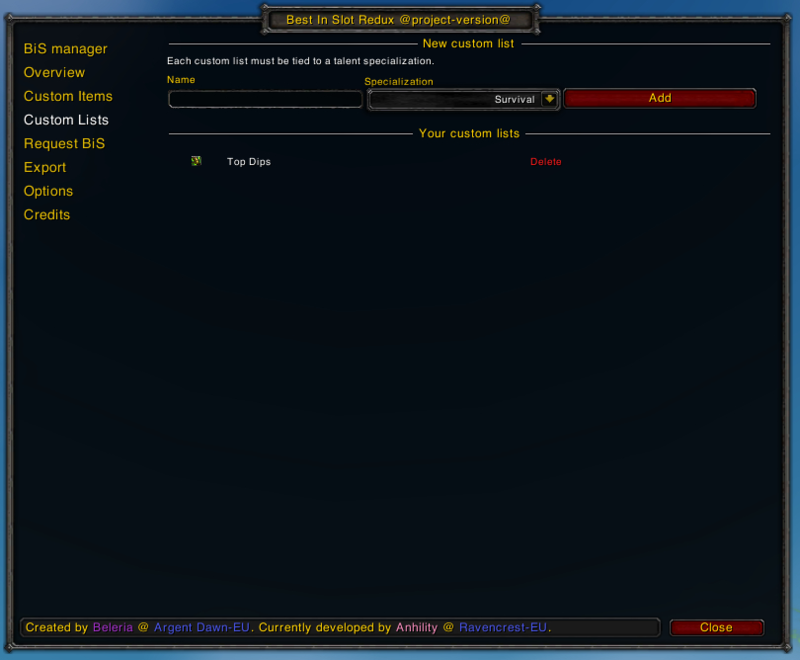 When I turn the on the option "only show missing items" the BiS Items are displayed. Somebody else have this issue? Might it be possible to also add dungeon location to each item? Instead of just the boss name? Find it hard to link each boss name with each dungeon. In build 8.0.2 there are no daggers for sub rogues to choose from, axes, maces, swords and fist weapons. Will check it out. In which module? It is the same in both Battle for Azeroth Dungeons and Raids. My guess would be that the same logic would apply to World bosses too, but they do not drop any weapon so it cannot be seen. If I may ask, it would be neat to have a copy button in the Raid module that copies the same items to all difficulties but with the corresponding item. 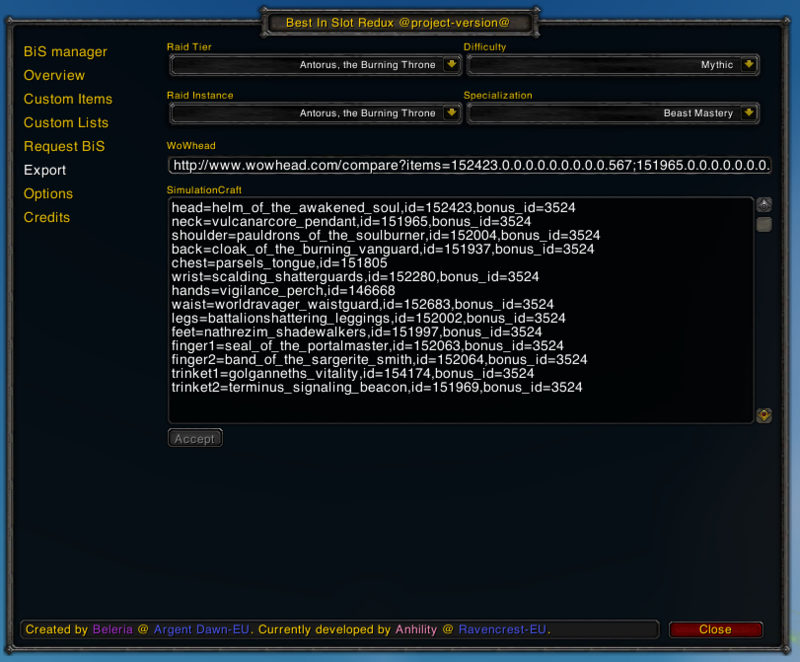 Arms warrior BIS gloves is a BOE from Uldir. When I try to add it as a custom item, it gives the error "The minimum item level of custom items is 550". 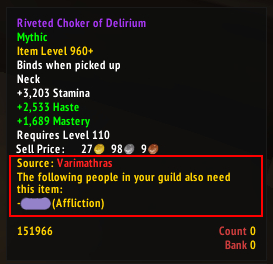 Please update the ilvl threshold.